“Oh man, the next generation is going to put us all to shame.” That’s the conclusion we came to yesterday. The staff of Launch Academy spent the morning at Josiah Quincy Elementary - a somewhat secluded Boston Public School located in the outskirts of Chinatown. After following an internal brick walk, and winding our way up stairwells and hallways filled with student artwork, we came to a brightly colored library filled with books, computers, and eager little learners from Kindergarten through 5th Grade. 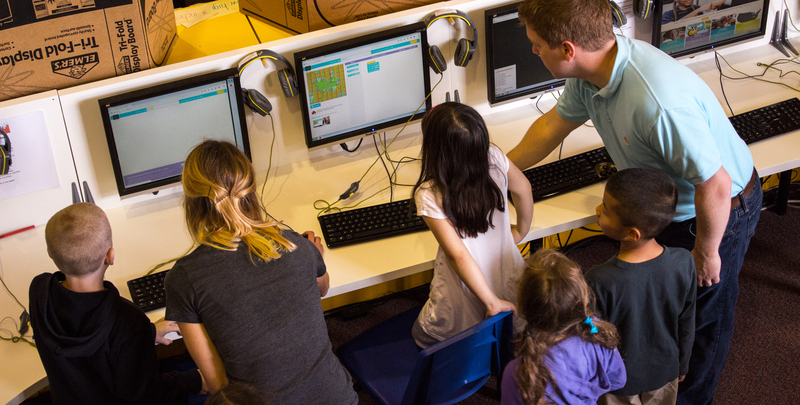 We exposed the energetic tots to Code.org. What we expected was a very careful walk through coding, in very simple terms. Instead what appeared was a flurry of skating Elsa’s from Disney’s Frozen. Angry Birds followed code prompts to chase green-faced pigs. Adding line by line, the students built their own code - ‘move forward’ then ‘turn left’ then ‘move forward’ then ‘turn right’. One student promptly explained what needed to happen before swiftly piecing together his code line by line. We were stunned by these students and how deftly they learned basic programming concepts and skills. They’ll have our jobs soon, and if the current track follows, that’s totally deserving. We hope that they push the limits of the generation before them, and continue to be exposed to opportunities in new technologies. We watched our Boston youth clap their hands and fist pump with excitement after completing each level of child-friendly code blocking. Tomorrow we’ll hear them ask questions of their teachers about what life is like working as a developer. Well, maybe they’ll ask in a few years. From what we witnessed, programming will probably be as natural as breathing. For us, these feel good moments reaffirm why we teach.